Supporters of Kentucky’s 2011 House Bill 463, a landmark corrections reform bill, gathered Wednesday in the Capitol Rotunda to hear the latest evidence of its continued success. 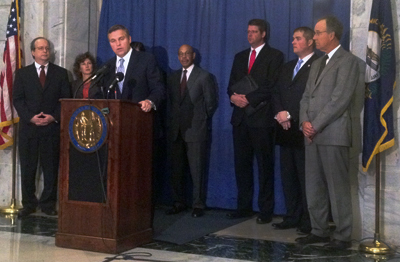 Chamber President & CEO Dave Adkisson joined Rep. John Tilley, Sen. Whitney Westerfield and various members of the law enforcement community to voice support for the reform’s impact. Rep. Tilley, who played a fundamental role in passing the legislation as the chairman of the bipartisan task force responsible for drafting the bill, announced several impressive milestones achieved as part of the reform effort. Kentucky has seen a steeper decline in its prison population than any other state in the south, dropping more than 8 percent since July of 2012. Perhaps of most significance was the drop in the state’s recidivism rate – the percentage of prisoners who, after completing their sentence, commit another crime – which decreased by 4 percent, the lowest rate in more than a decade. Adkisson once again commended the legislature for their bi-partisan work on this effort. “Today’s announcement is an excellent example of what can happen when we put politics and bickering aside. Kentucky is finally being ‘smart on crime’ and rather than wasting money locking up low-level offenders, we are saving money that can ultimately be funneled back into important areas like education,” said Adkisson. As of now, the bill is still on track to save the Commonwealth over $400 million in the next decade alone.